Jake is our stately gentleman. He is out of our beloved Dulzura and by White Violet Farm’s multiple award winner, Providence Rennes. Jake is also our babysitter boy. He is wonderful as a buffer to introduce newly weaned boys to the main herdsire group. 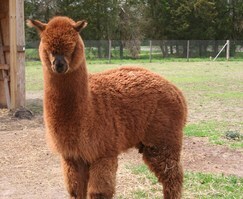 Jake has a wonderfully dense fleece with a very nice staple length and handle. He passes these traits, along with his stately bearing to his crias. You can see two of his crias here on the farm in Esteban and Remington.